Superior Spray Foam Insulation uses Foam-LOK™ brand Spray Foam System by Lapolla. Foam-LOK locks in energy savings by adding an exceptionally high R-value insulation system to the building envelope and the roof deck. This is very important in the Northeast region as many homes are old and have plenty of air leakage. This advanced insulation and roofing system is spray applied to any shape and substrate. It seals the building envelope to stop heat transfer through the roof deck, minimizes conditioned air from escaping, and restricts unconditioned air from entering the building. Foam-LOK™ Spray Foam System is great for roof insulation. With construction expenses increasing and greater awareness of the long-term affects of energy use, building owners and design professionals are looking for cost-effective alternatives to conventional roofs. 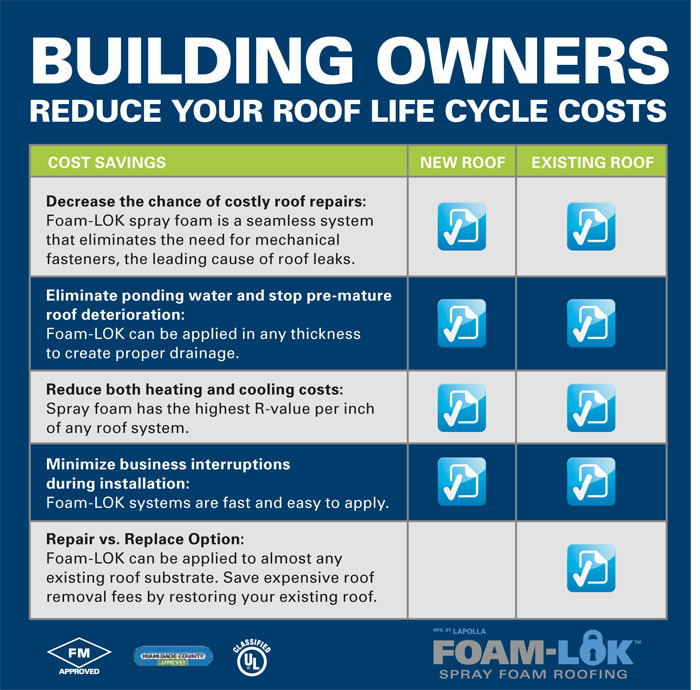 Foam-LOK™ is the alternative; a system that provides builders, architects, and owners with roofing solutions that support energy conservation, eliminates leaks and builds confidence. Superior Spray Foam Insulation is the authorized spray applicator of Foam-LOK™ in New York, North Jersey, Connecticut, Rhode Island and Massachusetts. Contact us for a FREE estimate today!